"I've been obsessed with this crispy fried snack ever since my friend brought the recipe back from South Africa in 1988. This is adapted from a recipe she learned in a cooking class taught by a renowned Indian food authority in Cape Town, Ramola Parbhoo." Combine the chiles, garlic, ginger, 1 teaspoon salt, 1/8 teaspoon turmeric, and 2 teaspoons vegetable oil in a food processor or mortar and pestle and process into a fine paste. (Add a tablespoon of water if you need more liquid.) Set aside. Place the potatoes in a saucepan with the water and bring to a boil over high heat. Reduce the heat to low, cover the pan, and cook the potatoes until they're soft and easily pierced with a fork, about 15 minutes. Reserve the cooking water. Mash the potatoes while they're still warm, using some of the cooking water to get a smooth consistency. 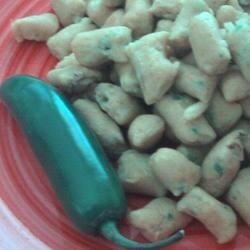 Mix in 1 tablespoon green chile paste, chickpea flour, 2 1/2 teaspoons salt, 1 teaspoon turmeric, and mustard oil. Add enough reserved potato-cooking water as needed to make a soft dough. Taste the dough for heat level and seasoning (the dough will taste raw, but should be salty and spicy; the flavors will mellow slightly during cooking). Add more salt and chile paste if desired. Heat the cooking oil in a deep pan over medium-high heat. Use a potato ricer (or sev machine, if you have one) to press noodles into the oil. Fry until golden brown and crisp, about two minutes. Use a skimmer or slotted spoon to transfer the noodles to a paper towel-lined bowl. Repeat until all noodles are fried. Store in an airtight container for up to two weeks. See how to make a spicy vegan curry with chickpeas and potatoes. Be careful handling chiles: use rubber gloves to avoid getting the oils on your skin. For step-by-step tips on how to fry, see our Deep Frying Advice article.